We have had a UPS Saturday Delivery nightmare. Next time I order a package FedEx delivery is gong to be requested. You will not believe what happened to us over UPS Saturday Delivery. What a mess! Let me say first that Amazon was on the ball! The shipping notice was text messaged to Hubby not long after the order was placed. We tracked its progress through at the UPS channels through late Friday night. All looked set for the box to arrive the next day. The text message we got the next morning changed all that. My box that was set for UPS Saturday delivery arrive after the non-holiday weekend. Never mind that I paid extra for Saturday delivery because I needed the box for class on Monday, or that no one would be home to sign for it. My dissatisfaction was tweeted a phone call made. The agent said the only thing he could do was to send an email asking the delivery be put on hold in favor of pick-up. But, he couldn't guarantee that would work. Updates would come via the UPS My Choice account. Grumbling me logged in awhile later to be sure updates were activated and guess what? The screen said the package was out for delivery! I called them again. 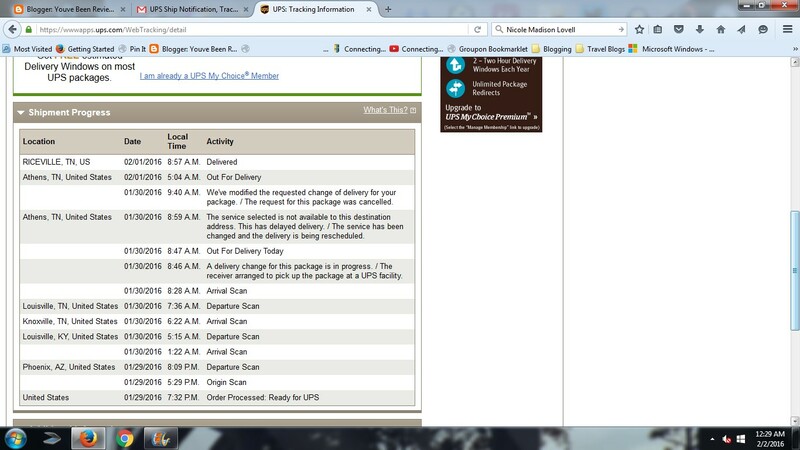 The agent assured me that yes, the package was out and would probably be received by 4:30. The order for pick-up was cancelled. I did the happy dance and sat back to wait. On the next phone call about UPS Saturday Delivery the agent assures me that all is well. Tells me the package would be here by the close of business on Saturday and just to wait until 7:00 pm. He said he was "certain" the package would arrive on time that evening. Hubby picked it up on Monday morning. He was then told that UPS Saturday delivery doesn't exist for our address. He said that the agents were very nice, sympathetic even, but UPS Saturday Delivery isn't available for my area! We were sold something that doesn't exist! Inexplicably, the messages changed between the time and date that the screenshots were taken. What about the extra money I paid for service that isn't offered? Take it up with Amazon because the box was ordered from them - even though they got the package out quickly. Even though USPS sold us something that doesn't exist. 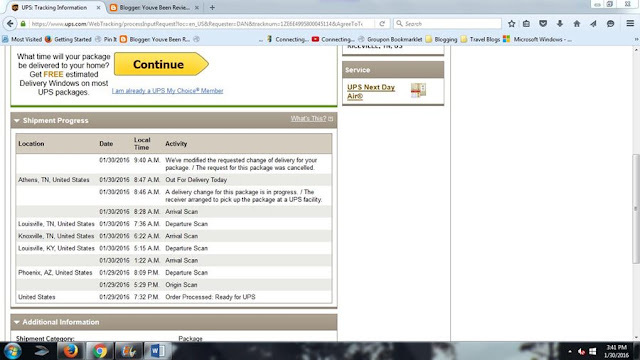 I'm so fed up with the UPS Saturday Deliver fail that I want to scream! Remember stories of high school seniors who sold elevator passes to freshmen? This feels like a modern version of that old tired story. Has anyone else had this type of experience? If so, how did you handle it? Leave your suggestions via Google Plus below.